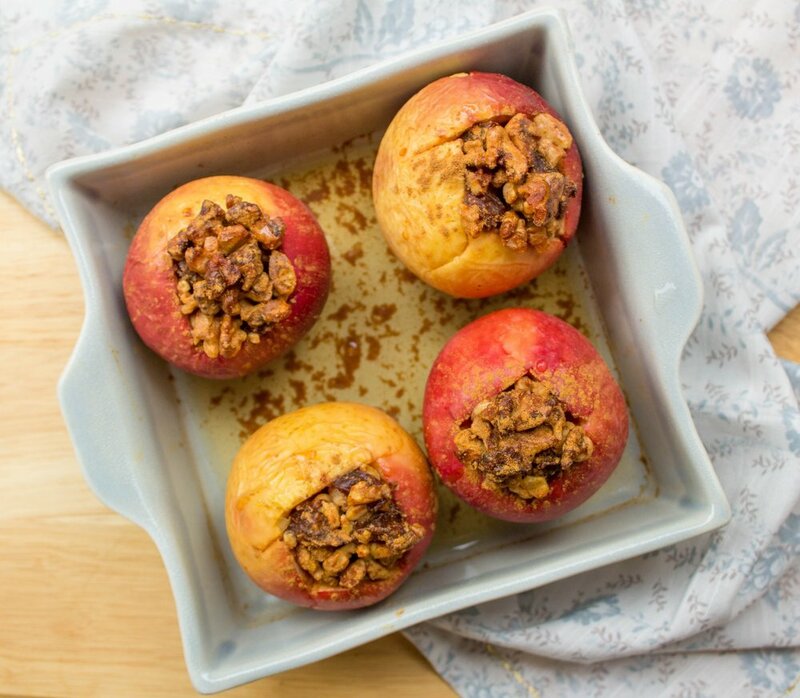 Baked Spiced Apples — Copina Co. The perfect recipe for Fall is here! These baked spiced apples are made with under 10 ingredients and are completely plant-based and gluten-free.They're absolutely gorgeous and completely delicious, but that's not even the best part of them. These take just 5 minutes to prep and makes your whole apartment smell absolutely dreamy. The apples are seasoned with cardamom cinnamon and nutmeg and are stuffed with walnuts and dates. They’re absolutely beautiful when they come out and make a great Fall dessert with coconut cream or even a fabulous breakfast on their own or chopped in a big bowl of oats. Try them out! You’ll fall in love. Start by washing the apples and using a small knife to cut down at about a 30* angle in a circle around the stem. You want to try to get the seeds out here. If they don’t come out when you do your initial cutting of the stem, use a kitchen knife or a spoon and work them around in a circle inside the apple. What you want is to remove the seeds and also create enough room to stuff the apples. Don’t cut all the way through though! Next, in a small bowl, mix together the nuts, spices, maple syrup, and dates, then pack this mixture into the apples as tightly as you can. Grab a brownie pan that can fit all 4 apples snugly, then just place them inside. I find it’s helpful to pour ½ cup water mixed with 2 tablespoons of maple syrup over the apples and onto the base of the pan. It helps everything stay nice and moist as you roast. You’re now ready to put everything in the oven! Cover the apples with tin foil and bake for 20 minutes, then remove the foil and bake for an additional 10. This helps them cook all the way through without burning the nuts. Remove them from the oven and enjoy!